"What did early Dutch settlers eat? Where did their food come from? Why is it called a Dutch oven? Learn the answers to these and more questions at Crailo State Historic Site! On July 21st join us at Crailo for 'Summer Seasonals', a special educational program featuring Colonial Foods Focus tours at 11:00 and 1:00 followed by a hearth cooking demonstration. Using colonial era recipes and 17th century methods, an experienced hearth cook will demonstrate how early Dutch settlers prepared farm-to-table meals with summer vegetables, fruits, and other seasonal foods." The tours are at 11 am and 1 pm, and the cooking demonstrations will immediately follow in Crailo's cellar kitchen. It's $5 for adults / $4 for students and seniors / free for kids 12 and under. "Join interpreters in period dress to discover how colonists in the Hudson Valley would make ice cream in the middle of the summer without freezers and electricity. We will be using a reproduction sabotiere, ice cream molds and trying some period recipes. And learn a simple way to make your own ice cream!" The event is from 11 am to 4 pm that Saturday. It's $3 for adults / free for kids 12 and under. The Crailo State Historic Site is at 9 1/2 Riverside Avenue in Rensselaer, right across from the Hudson River (it's a beautiful block). 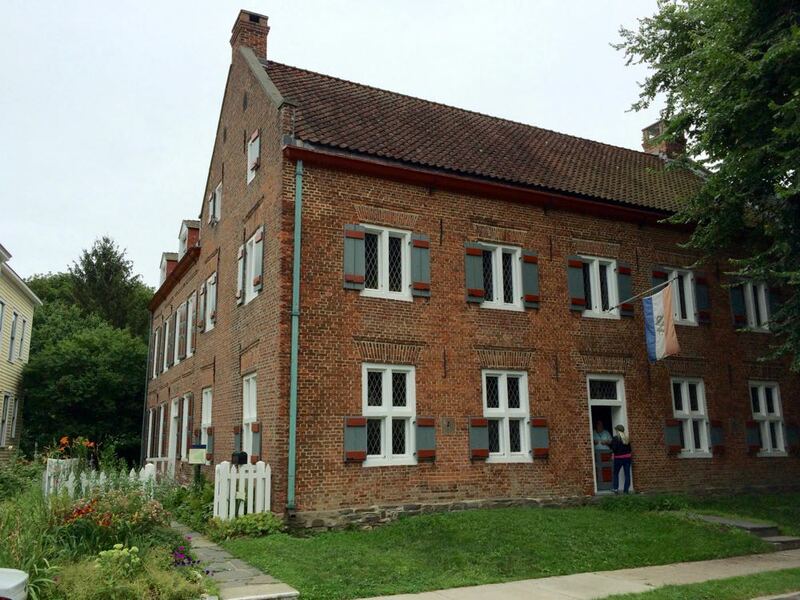 It was once a home for the Van Rensselaer family and now serves as a museum of colonial Dutch history in the Hudson Valley. It was named after the Van Rensselaer's estate in the Netherlands -- Crayloo or Cralo -- which meant "crows' wood" in Dutch. Once a Dutch holiday commemorating Pentecost, Pinkster became a distinctly African American holiday in the Hudson River Valley during the colonial era. During the 17th and 18th centuries, enslaved and free African Americans transformed Pinkster from a Dutch religious observance into a spring festival and a celebration of African cultural traditions. All along the Hudson River and on Albany's "Pinkster Hill" (the current site of the NYS Capitol), enslaved African Americans reunited with family and friends and celebrated Pinkster with storytelling, food, music, and dance. Other Pinkster traditions, like the selection of the Pinkster King, created opportunities for enslaved African Americans to honor respected members of the community and to subtly mock their white enslavers. The Crailo celebration will include presentations about the experiences of enslaved Africans and African-Americans in colonial New York, traditional dancing and theatrical demos, storytelling, music, a culinary historian preparing food and interpreting historic African and African-American foodways, along with crafts, games, and refreshments. The event is Saturday, May 26 from 11 am to 4 pm. It's free. The Crailo site was once a home for the Van Rensselaer family and now serves as a museum of colonial Dutch history in the Hudson Valley. It was named after the Van Rensselaer's estate in the Netherlands -- Crayloo or Cralo -- which meant "crows' wood" in Dutch. It's on a beautiful block in the city of Rensselaer along the riverfront.